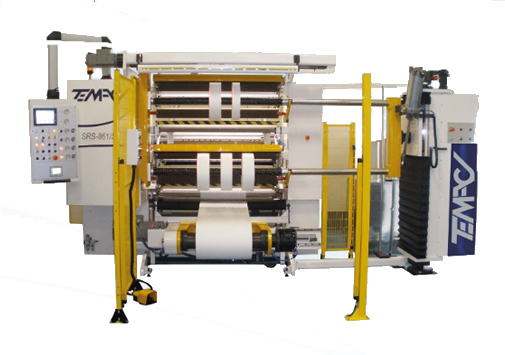 Tipologie: Dual-Shaft Slitter Rewinders and Rewinding Diameter up to 600mm. a great number of flexible materials and satisfy the more diversified demands. Compact unwinding group “Shaftless” type located in front machine side. Rewinding stations endowed with fully clutched shafts with ball spheres system to lock the cores during the rewound phase. Twin slitting systems with oscillating magnetic razor blades and shear circular blade units. “Laser” aid core positioning system. Main control panel assembled on a pivoting console frame with adjustable angle. Side rewound roll unloading fork system. Fully automatic lay on roll weight control managed by “Touch Screen” unit. All machine controls are managed by wide color “Touch Screen” unit. This unit is able to store all machine parameters and several work menus for an easy and quick machine set-up. Unwinding web tension control managed by A.C. asynchronous servo motor driven by fully digital Inverters with “vector” mode configuration. Fully automatic ended rolls “push out” system for both rewinding stations. Fully automatic “Laser” core positioning system managed by “Touch Screen” unit. Remote web control machine check-up ETHERNET CONNECTION.